-Fresh, beautiful and delicious sushi, plus grilled items and cocktails. 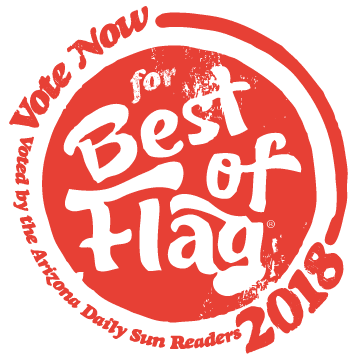 Help us win Best of Flag by the Arizona Daily Sun! Karma Sushi Bar Grill serves fresh, beautiful, delicious sushi, grilled items, ramen and cocktails in the hip, casual setting of one of downtown Flagstaff’s best restaurants. Karma Sushi is consistently voted “Best Sushi’ in Flagstaff by readers of the Arizona Daily Sun. Each of Karma’s dishes is hand-made in the moment by masterful chefs. Their grill menu will please even non-sushi fans. Stocked with all your favorite spirits, the bar is staffed by knowledgeable and inventive mixologists. Karma Sushi Bar Grill offers an extensive take-out menu with convenient drive-up pickup as well as party platters to feed a crowd. Whether you want a quick lunch, are meeting friends for happy hour, or want to linger over dinner for a special occasion, Karma Sushi Bar Grill is precisely right. Located in downtown Flagstaff on Historic Route 66, Karma Sushi is centrally located across from the Flagstaff Visitors Center and Amtrak Train Station. On-street parking is available, with additional parking across Route 66. Download the parking app here. To sign up to receive our emails, fill in the following fields and hit submit. Menu prices subject to change without notice.